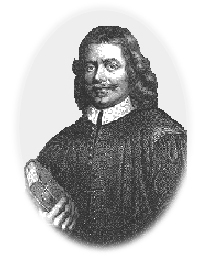 John Bunyan is perhaps the most popular religious writer in the English language. His best known work, The Pilgrim's Progress has been translated into more languages than any book other than the Bible. Bunyan was born at Elstow, England, about a mile from Bedford, the son of a poor tinker (a maker of metal utensils). He probably acquired most of his knowledge of the English language from reading the Bible. As a young man, Bunyan served in the Army and fought in the English Civil War on the side of the Roundheads. He married in 1649, and among his new wife's possessions were copies of Dent's Plain Man's Pathway to Heaven and Bayly's Practice of Piety. Reading these had a profound influence on Bunyan's spiritual life. In 1653 he joined Pastor Gifford's Independent Church, in Bedford. Shortly thereafter he began to preach, and his preaching proved to be popular with his listeners, but not with the magistrate in Bedford who sentenced him to jail for "unauthorized preaching." Bunyan was set free, but he again jailed after he refused to stop preaching in public. His imprisonment was intermittent from 1660 to 1672, but he used the time to begin writing The Pilgrim's Progress and several other works, including some poetry. Bunyan's major works are The Pilgrim's Progress (Book 1: 1678, Book 2: 1684) The Holy War (1682), and Grace Abounding to the Chief of Sinners (1666). Bunyan proved to be a master of a simple, homely English style of writing involving the use of narrative and allegory. Along with Foxe's Book of Martyrs, Bunyan's The Pilgrim's Progress was read in virtually every Victorian home and remains a best seller for youth and adults alike. His works are considered devotional classics among Christian literature. Theologically, Bunyan was a Puritan in that he held a Calvinist view of grace, but he was a separatist in his view of baptism and the church. Congregationalist and Baptists alike claim him as a spiritual ancestor. The widespread translation of his works speak of their appeal to individuals of many different traditions and nationalities.